Wal-Mart’s “everyday low prices” and one-stop-shop philosophy have endeared the retailer giant to Americans as consumers, but the chain’s powerful influence on manufacturing has also had dark consequences for Americans as workers. This control of the market has given Wal-Mart a lot of influence over what manufacturers produce. “Wal-Mart has reversed a hundred-year history that had the retailer dependent on the manufacturer,” Nelson Lichtenstein, a professor at University of California Santa Barbara, said in an interview with Frontline. In the post-Wal-Mart world, the manufacturer is dependent on the retailor because the retailer knows exactly what the customer wants. 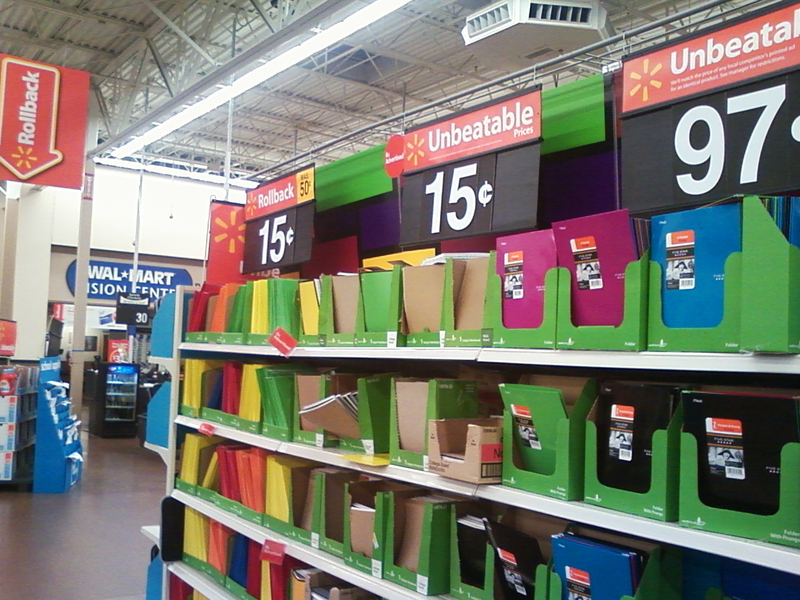 Even major brand names like Rubbermaid couldn’t stand up against the Wal-Mart business model. Rubbermaid was sold after a severe sales decline; a decline that took place after Wal-Mart decided to significantly cut back their stock of Rubbermaid products. Wal-Mart’s skyrocket to the top faltered in 1992 when the company’s founder, Sam Walton, passed away. Walton’s death caused Wal-Mart’s stock to plummet, and the company’s new leaders desperately needed a way to boost sales and improve investor confidence. Their solution laid to the East. Wal-Mart’s low prices come at the expense of American manufacturing jobs. After Walton’s death, Wal-Mart dramatically increased their Asian imports, especially from China. The move was a huge success. Chinese labor was much cheaper than manufacturing labor in the U.S., allowing Wal-Mart to import goods at a much lower price than it would cost to stock their stores domestically. By the mid-90s, Wal-Mart was hooked. The retail giant was dependent on Asian manufacturing, and the company was encouraging many of its suppliers to move their manufacturing centers to Asia in order to remain competitive within the Wal-Mart business model. The retailer’s savings through Asian, and specifically Chinese, manufacturing are what allow Wal-Mart stores to offer the low prices that attract so many consumers, and consumer satisfaction encourages Wal-Mart to continue importing from China. The consequence? Manufacturers are then pressured by the market to move their production, and jobs, to China just to stay profitable. Join us next week to learn more about Chimerica and what it means for American manufacturing. In the meantime we invite you to explore the rest of AWS Learning, where you can find online courses, podcasts, virtual conferences, and other digital tools to help you advance your welding career. You mentioned Rubbermaid in your comment, I bought shares of this company before it was sold to (NWL) and it has increase my equity a lot. (75% in 3 yrs). How is that a bad thing? The comment on the Rubbermaid investment is interesting. Is there possibly an established correlation between the Walmart / Chimerica effect and the increasing disparity in wealth in the US? This gentleman made a good profit from the move, but it would be easy to argue that the worker that lost their job, the plant management that ceased to exist, the local facilities contractors that lost the support contract for the plant that closed, the local businesses that lost a spending public, and a county / state that loss tax revenue etc. did not do well with the Rubbermaid acquisition. This may be an example where as a whole, we (imperial we, but no one in specific) all would have rose 2 – 6 % over time had the manufacturing stayed here. But with the changes, a few people made 50 – 75% over time.